← Clouds in the sky, but no shells on the seashore. Hmm… chocolate chip cookies, french-pressed peaberry coffee, and rain out the window… I don’t know what to think about the rain. I was wishing for it a few days ago, but now all I can think about is when the rain will stop so I can go work on my new ideas. Besides, I’m pretty sure it will turn into snow today. I had yesterday off, but it’s back to the grindstone today. Most days I don’t mind, but I liked working there better when I was out in the greenhouse. I am looking forward to the arnica harvest, but it might come at the same time when I need to leave for the workshop (it’s in 11 days 🙂 ). For now, I am stuck inside sweeping floors, but maybe I can make muffins today if my boss hasn’t already. Last night I was thinking about something. I was opening myself up to psychological possibilities, and I decided that I watch too much TV. I know I’ve mentioned it before, but this is what I was thinking about: I watch TV, my little brother plays video games for about 16 hours a day, and my dad is always running around doing projects or fussing about my projects being too spread out and he has the den all wrecked to pieces and covered in plastic– because it comes down to the fact that people can’t just sit and be content thinking. I know I’m not. I have a compulsive need to feel productive and feel like I am making good use of my time. It makes it hard to relax or sit around much without feeling guilty. People feel the need to be constantly entertained or busy, because the thought of sitting alone without distraction and just thinking is absurd in the modern world. Self-awareness becomes lost in the everyday distractions, so nobody has to think deeper than the surface. I feel like I need to disconnect myself from those distractions and just go to the woods to sit and think without being interrupted. Also, at home I have been trying to change my physical surroundings to see what happens when I do. I moved my bed back to the upstairs bedroom, turned my downstairs room into more of a sound studio (keyboard, clarinet, 2 amps, and various guitars). I also moved another bookshelf into the room for my pots to give them breathing room, and I decided to donate/throw away at least 10 garbage bags worth of junk that was taking up space. I decided that there are things that I haven’t even touched in years that hold no more sentimental value, and getting rid of useless material things is a great feeling. I even donated a big bean bag chair. I think freeing up space is a move in the right direction toward moving forward and eliminating distraction. It was a little overwhelming, and it took me at least 4 hours to get all of that done. Now I can think about other things, like making new clay work and perfecting my home brew. It’s coming along nicely– the first small batch is almost gone, but I have another one brewing and I bought a bag of barley the other day of which a small portion is busy sprouting as I type. It’s a nice project to keep me busy (because I’m not as advanced as philosophers who could eliminate all distractions to be more aware of themselves) during the summer. I guess I may as well keep posting herbarium sculpture photos… it might help to motivate my thinking towards making a few more of them. 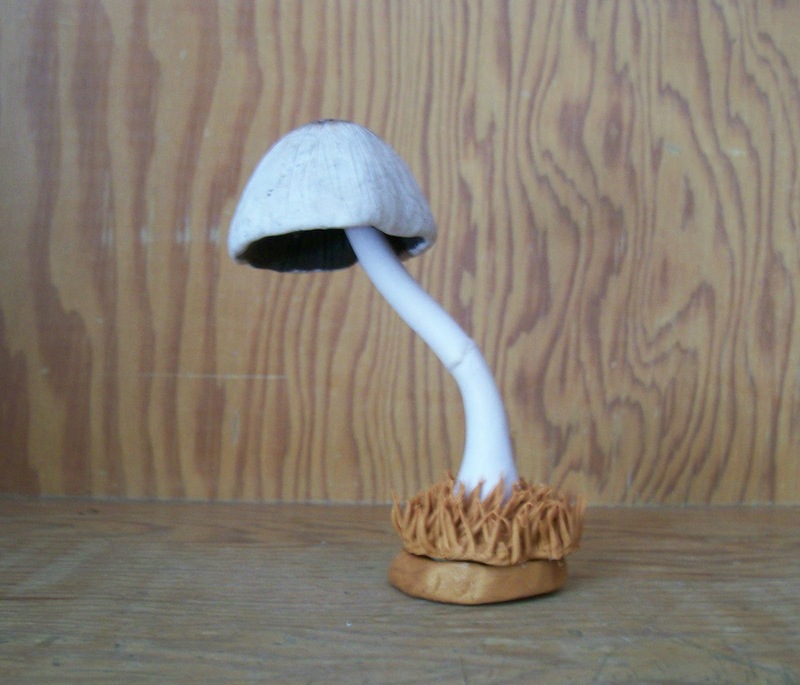 This entry was posted in Art, Ceramics, Daydreaming, Deep Thought, Food and Drink, Nature, Science, Sculpture and tagged coprinus atramentarius, gardening, greenhouse, home brewing, muffins, mushroom, sculpture, spring cleaning. Bookmark the permalink.